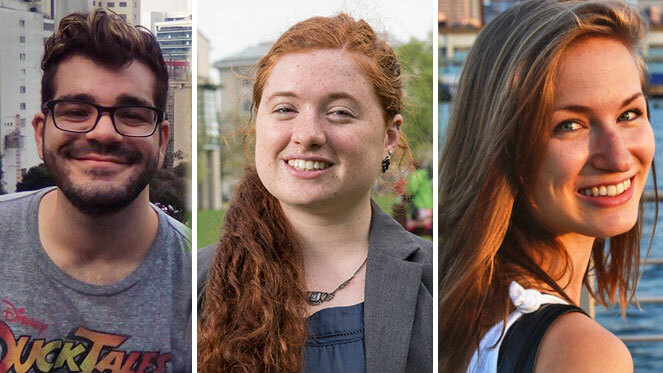 Carnegie Mellon University’s four Fulbright award winners for 2016 will research, study and report across three continents. One student and one alumna from the Dietrich College of Humanities and Social Sciences are among the new recipients. Additionally, Juan Acosta (DC’15), will pursue his Fulbright that was awarded last year. CMU’s Fellowships and Scholarships Office provides support to students who are interested in applying for nationally competitive fellowships and scholarships. Berry will travel from her hometown of Ridgewood, N.J., to Japan on a Fulbright Study/Research Grant. She plans to explore literature written by women during the economic slump of the 1990s, known in Japan as the “Lost Decade.” She will continue her language studies and audit courses at Hokkaido University in Sapporo. Fonner, of New Martinsville, W.Va., will study access to and the availability of creative arts therapies for U.K. military personnel suffering from mental illnesses. The recipient of a Fulbright-University of Warwick Award, he will enroll in the Master of Arts program in International Cultural Policy and participate in the Think Tank Society and Cultural Value Initiative. He also plans to join the Heart of England Co-operative Concert Orchestra as a percussionist. Kolb, of Cloquet, Minn., received a Fulbright Study/Research Grant to investigate how projected climate change will impact aquifer levels in northwestern Costa Rica. Working with a hydrologist, she plans to develop water management strategies for local stakeholders, whose water supply has been impacted by increased development and changing agricultural practices. She will be affiliated with the National University of Costa Rica, Liberia’s Center for Hydraulic Resources for Central America and the Caribbean. Mobertz, who resides in New York, received a Young Professional Journalist Award to report on the work experience of Millennials in Germany and the current state of labor in the country. She plans to cover mental health taboos in the German workforce, internships and job placement for recent high school and college graduates, and work options for young refugees. Acosta began his Fulbright English Teaching Assistantship in Brazil this past February. He is teaching English language and U.S. culture workshops, studying Portuguese and working virtually as a Re-imagine Learning associate with Ashoka, the world’s largest network of social entrepreneurs.